Vic Gundotra, Google’s Senior Vice President of Engineering, has already shown off Google’s Snapseed integration through a Google+ post yesterday. 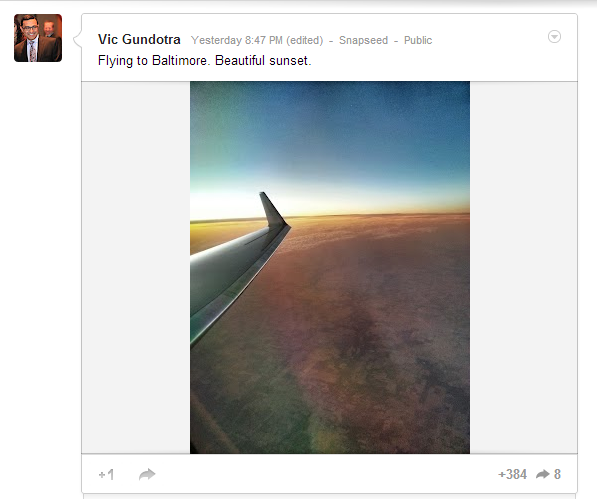 During a flight to Baltimore, Gundotra published a photo to his profile, which through a tag indicated that the photo was taken using the Snapseed app. Google recently acquired Nik Software, a company that specialized in developing and selling a line of digital image editing tools, just last month. But the acquisition was suspected to be motivated by Nik Software’s iOS photography app and Instagram competitor, Snapseed. Now, it would appear that Snapseed will be making its way to Android phones in the near future. As we’ve reported earlier, based on the latest data (June 2012) that Nik Software has released about the number of Snapseed users, it revealed that there are nine million users. It pales in comparison to Instagram, which has an excess of over 100 million users. Even if Snapseed has grown to 15 million users, there should be no mistakes that Instagram still outcompetes Snapseed — and then some. But it’s also available for Android and iOS, and adding Snapseed to the Google Play market would inevitably bump its numbers up. It’s possible that Snapseed will seen a deeper integration with Google products and perhaps the Google+ ecosystem, and if more users can be driven to Snapseed, we might see the partnership play out like a mini version of the Facebook-Instagram deal. Of course, the $4.99 to download Snapseed isn’t doing it any favors, and we’re wondering if that price tag will be around for long. But one thing is very nearly certain: Snapseed should be available for Android in the near future.